Someone once said that F.E.A.R is False Evidence Appearing Real. How true that is! If you’ve ever watched a scary movie late at night as child, and then had to enter a dark room, I’m sure you’ve experienced plenty of ‘false evidence appearing real’. Every shadow, every sound is that monster from the movie waiting to attack you. You cower in your bed, you shiver, you pray. Then you fall into a fitful sleep. In the light of day your fears seems silly, don’t they? Fear is really worry and insecurity. Fear has the power to make us sick. But fear gives us an opportunity to take risks and helps us build our courage. When I suggested the eulogy exercise in my post on Awareness the other day, several bloggers commented that they would find that a difficult thing to do. To my mind, growth calls for risk taking and moving out of our comfort zones. That’s where courage comes in. A big part of self leadership is to have courage. As Winston Churchill said, “Courage is rightly considered the foremost of the virtues because upon it, all others depend.” Courage is what forces us to move beyond the familiar and teaches us about who we really are. Courage is indispenable to our happiness and success. Karl Pillemer, a professor at Cornell University, interviewed over a thousand older Americans from diverse backgrounds, for his book ‘30 Lessons For Living‘. He asked them to share the most valuable lessons they’d learned. He says that the elders regretted more the things they didn’t do, rather than those they did! I think that about sums up what courage is! We don’t want to reach old age and look back with regret on all that we didn’t dare to do, do we? Write down 3 things you are really afraid of attempting to do. Next to each of these things write down what you’d regret/lose if you didn’t do them. Resolve to start acting on at least one of these today! 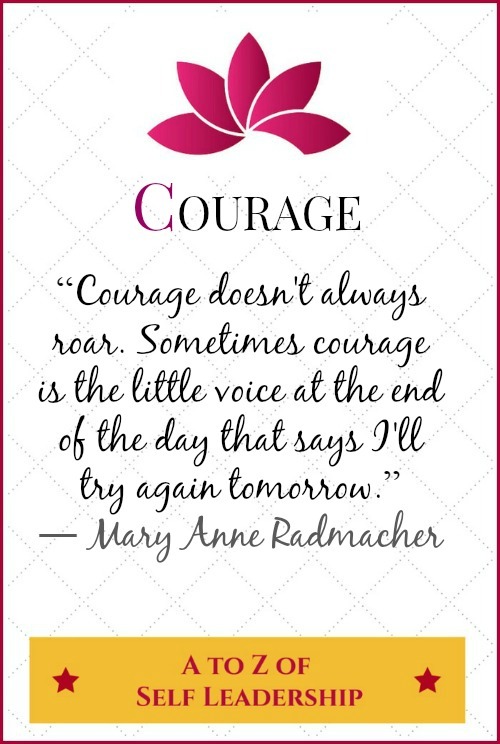 Sometimes courage is the little voice at the end of the day that says I’ll try again tomorrow. Today I’m on ‘C ‘ of the Blogging from A to Z April Challenge. My theme is the A to Z of Self Leadership. I’m also undertaking the NaBloPoMo for April – the theme is ‘grow’ and the Ultimate Blog Challenge. Loved it! I am going to take all the assignments one by one and do them! Also, of late I am trying to overcome my fears and suprisingly, it isn’t too difficult! It’s interesting that people regret things that they didn’t do–they don’t know what the consequences would be, so maybe they would regret doing them, too. Who knows! What can I say beyond, “inspiring.” Thank you! An inspiring post. Thank you. I am encouraged to read more. Happy A to Z! Write down 3 things you are really afraid of attempting to do. – I did take this first step. It is the third one … that sends me into a heart vs. head dilemma. This is the most helpful post I’ve read this week, Corrine…thanks! I found you from the A-Z list and I’m here because my midwife 47 years ago was called Gyaan! Your take on fear is interesting but you seem to be saying it’s all imagination, which clearly it can’t be. Fear is also nature’s way of keeping us from danger, surely? I love how you research a a topic so well, have your brand poster and action steps! Once when I was in the hospital in Dubai, I had just lost twins and I had some kind of fluid on my abdomen doctors couldn’t determine. So they had a long needle (I think it is also used for amniocentesis) and planned to extract some fluid. I was terrified of that needle. But I had this favorite nurse who held my hand throughout the procedure. I remember reading not long afterwards. Courage is not the absence of fear, It’s being afraid and going through it. Something like that. And I did feel courageous to face that! Thank you for your excellent post! Powerful post. How many of us feel the way the 80 year old in your story does – that we haven’t reached our fullest potential. But taking little steps in that direction makes the entire journey seem less overwhelming. Thanks for the inspiration to take a step. After reading your post, I can courageously tell that I am courageous. I have taken risks and moved out of my comfort zone. 1. I am a single child and was an introvert. To leave my home- town and relocate in Bangalore was a decision which my parents were dead against. However, I ensured that I would sail through and I did. 2. In between I tried the IT industry and became the Project lead (in banking domain), Alas, the IT company had to shut down due to their internal issues and I had to look out for my good old job in Bank again, which I finally found. 3. I was ridiculed, when I informed that I am gonna be a blogger. They said that a guy who studied in regional school with malayalam as the spoken language , how can he be a blogger ? But then here I am standing Tall against all the Odds. This post of yours made me proud of myself. Today, I forgot I had made an image for my LifeHacksForHappiness blog with Courage and suggesting doing one thing that the reader is afraid of. 😀 I went ahead and made another and posted it. I am bookmarking your post to refer to in one of my upcoming ones. One of the things I am truly petrified of doing is bungee jumping – I will gladly not do that and won’t regret it either 🙂 Courage does not mean you don’t fear it means you feel the fear but do it anyway. Great post. We often don’t have the courage to follow all our dreams. If only all of us mustered the courage to act on them. Motivating post as always, Corinne! Absolutely Corinne ! We need to be able to say yes to things that we wish to do rather than reject them only to repent at old age on the disappointment. 🙂 Very inspiring. Nice inspiring post.. I always write wen I am confused abt makin a decision or wen I have 2 choose one option from many… I write pros n cons .. gives me a clear idea..
A wonderful post yet again! We miss out on so many opportunities if we don’t show courage. I like doing the activity you suggest in each of your posts. I have shied away from doing many things for want of courage and regretted later. Hope I never let that happen again. Already on Day 3! Are you on EST? It’s only 4 pm in Hawaii! Yes, agreed, courage can be small voice, not a loud roar. Courage is doing the A to Z Challenge! Ah it’s my pleasure – I’m really, REALLY enjoying these, and trying to take lots from them 🙂 Thank you for writing them! They’re really good. I love that acronym for fear. It’s a great way to put fear in it’s place and move forward!! Another fantastic post, Corinne. Wonderful pointers for action steps. I recently did an exercise like that. I always wanted to write, but never really gave it a go, until recently when I started to blog. Writing down the list of things I will regret if I did not do, made me start my own blog. Staying tuned for D. Cheers! Thanks, Shantala! I’m so glad you had the courage to start blogging. You’re doing a great job of it too!